From the Hancock County Court House, go 2.6 miles northeast on Hwy 22/15 to the split and then go right on Hwy 22 for another 10.4 miles to County Road 28, which forks off to the right, next to the Powelton Baptist Church. 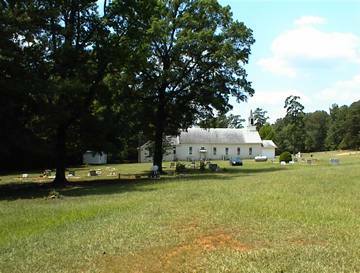 Follow County Road 28 for 0.2 miles to the New Hope Powelton Baptist Church and cemetery on your right. Burials that have occurred since the cemetery survey are numbered 200 or higher and are based on obituaries. On same headstone as Lessie L. Battle. On same headstone as William H. Battle. "Beloved Husband, Dad, and Granddad"
Unmarked slab. All info per Watts Funeral Home tag. Age 81. All info per funeral home marker. Info from funeral home tag. Rest of info is unreadable. Age 86. All info per funeral home marker. "Master" as in Master Christopher Houston. Information difficult to piece together. "Our Beloved Mother and Grandmother"
In fenced lot with Beah Henry Johnson. In fenced lot with Rev. W. J. Johnson. Has a repeating pattern of "S" stamped all over the slab. "Minister of the gospel from 1876-1916. He died as he lived - a Christian." Recent grave (8/2002) with Askew Memorials' funeral home flags. "Mom" in flowers on the grave. Has a very faded Ingram Bros funeral home tag. "Loving children" On same headstone as Edna Leslie Alexander. "Loving children" On same headstone as Wyman Alexander. Age 87. All info from funeral home marker. Woodman of the World gravestone fallen over and unreadable. Footstone has initials A. H.
A large open area with 50 to 100 graves possible. Death year very hard to read. "We trust our loss will be her gain, And that with Christ she's gone to reign." Piece of a marker. No dates. Age 51. All info per funeral home marker. TEC 5 589 Ordnance Ammo Co.
Death year hard to read. "Dear Mother". "Honored by J. B. Andrews" is on back of marker. Marked by long field stones. Possibly as many as 4 graves. Possibly as many as 26 graves. A broken marker with parts missing. Marker with nothing readable under a tree. w/o Crawford Moss, Jr. "A good woman"
"Peace be unto you. Rest Daddy." Broken stone with only "saylar" readable. Difficult to read funeral home marker from Dawson Mortuary. "Remember me with a smile"
w/o Frank Alexander. "To my wife". Marker is under a cedar tree. Age 70. All info per funeral home marker. Marked by a field stone. "Gone to be an angel" Name is spelled as above, although others in this cemetery spell it "Castleberry". As many as 12 graves. Info per Watts Funeral Home marker. Age 28. Ingram Funeral Home marker - very hard to read. Stone is broken just above death date. Mounded grave marked by a field stone. On same headstone as Charlie Battle. On same headstone as Mattie Battle. Age 90. All info from obituary. Age 52. All info from obituary. Age 73. All info from obituary. Age 7 months. All info from obituary. Age 71. All info from obituary. Age 84. All info from obituary. Age 81. All info from obituary. Age 89. All info from obituary. Age 35. All info from obituary.